With the new year quickly coming into view, people everywhere are rolling up their sleeves and getting to work on creating a better life, becoming a better version of themselves—yes indeed, it’s time for New Year’s resolutions. Recent developments in nutrition science and environmental concerns are bringing more and more people to embrace a shift toward vegetarianism and veganism, yet this change can seem daunting and even those with the best intentions may become discouraged from making the leap. There is a program that makes going vegan not only easier, but truly welcoming: Veganuary. 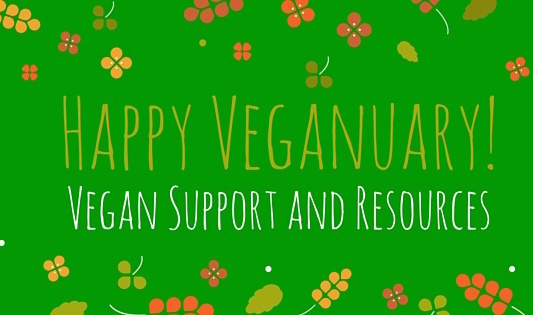 Veganuary Limited is a UK-based organization promoting a comprehensive month long trial run of veganism, giving those interested in the reasons for and logistics of a vegan lifestyle the support and encouragement to embrace a life of eating plants and thinking about their consumer choices. Veganuary aims to reduce the suffering of animals by inspiring and supporting people across the globe to go vegan for the month of January. The hope is that by providing a foundation for positive change and helping new vegans and the veg-curious begin their journey on the right foot, people will be able to avoid the common speed bumps and deterrents on the road to a lifetime of positive change for the animals, the planet, and individual well-being. Recidivism rates are highest within the first year of making any change in habit, and the Veganuary program sets out to make it easy to go vegan and, more importantly, stay vegan. 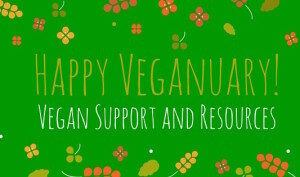 The Veganuary program sends registrants daily support emails with helpful information and recipes to make the transition as easy as possible, and will continue to periodically send out news and information after the month is over to help people stick with their positive lifestyle choice throughout the year. Interested? Go to Veganuary.com today and sign up for free! There you will find information on how going vegan helps animals, the planet, and your health—there are also delicious recipes, a guide for dining out, a list of great vegan products available at supermarkets, a blog with tips on vegan travel and celebrating holidays as a vegan, and an extensive list of myths surrounding veganism. Better yet, why not ask a friend to take the challenge with you? Having someone else to share your experience usually makes it easier to stick with any new lifestyle choice, be it fitness, diet, or just trying to change a bad habit. Someone who feels supported, and can be supportive to another, is far more likely to continue on the road to progress than someone who is daily faced with the old, familiar patterns of behavior. So sign up today and take that first step toward a more compassionate, healthful, and happy life!